Griffin Fletcher was born in c.1792 in Toseland, which lies to the east of St Neots in Cambridgeshire. He was the son of Griffin Fletcher senior. From about 1820 he was a driver of the Ad Eundem coach service between Oxford and Cambridge (named after a type of degree) and also one of its proprietors. Griffin had settled in Oxford in the 1820s, while his father and his brother William Fletcher ran Comberton Farm just to the west of Cambridge, so the family was ideally placed to run a coach service between the two universities. Ann Andrews was born in Oxford on 28 October 1801 and baptised at St Michael’s Church on 25 November. She was the daughter of Richard Andrews and Mary Jane Wells, who were married at that church on 11 October 1791. Her parents had six other children baptised there: Andrew Andrews (1794), James Woodington Andrews (1797), Eleanor Elizabeth Andrews (1800), William Woodington Andrews (1803), Joseph Wells Andrews (1805), and William Henry Andrews (1809). At the time of the 1841 census Griffin Fletcher, described as a coach proprietor, was living at Holywell Street with his wife Ann and their children Mary Ann (10), Frances (5), Priscilla (2), and Sarah (five months), plus a servant. They were still at that address when two of their daughters died near the beginning of 1842, but by the autumn of 1843 they had moved to Walton Place. With the present facilities for locomotion, university men have little idea of the difficulties of access to Alma Mater half a century ago. As all must appear almost simultaneously, the stage-coaches and chaises at the commencement and close of term drove a brisk business, and places were booked long in advance. There ran at that time a coach between the two universities, appropriately named the “Ad Eundem,” driven by a well known character, Griffin Fletcher. His conversation was garnished with racy anecdotes adapted to the humours of his passengers. If he saw that most of them were Oxford men, he would show a decided bias for Oxford: if they were Cantabs, of course he must incline to them, and when he saw, as was sometimes though rarely the case, there was a mixture of the two, he observed a judicious silence, or “shifted his side as a lawyer knows how,” to suit both. The wags often attempted jokes upon him, quizzed the appellation of his coach as bad Latin, and similar criticisms, but he was never ruffled. He was not averse to a refresher en route, and his ways of suggesting it were amusing. “Did you ask me, sir, the difference between an Oxford and a Cambridge man, sir? Well, one difference is this, if I stop to change horses, which I shall do presently, the Cambridge man descends, orders himself a glass, then looking at me, says he, Fletcher your good health. Of course I raises my hat, what else sir, can I do? But an Oxford man says, Fletcher, what would you like, and I reply, a glass of brandy and water sir, if you please.” Of course the fare (if an Oxford man) took the hint and supplied the desired beverage. As Fletcher had driven his coach on that route for some thirty years, he knew the whole neighbourhood well; it may be added that every one knew him. One passenger drew his attention to a large field which presented a very bare appearance. “It may well do so, sir, it is one of the Duke of Buckingham’s farms, and that field borders on one of his copses there”, pointing to it with his whip. “That copse swarms with game, which get their daily food from that field.” He then proceeded to describe the whole of the estate round Stowe (the seat of the Duke of Buckingham) as resembling a farm-yard, the game being so strictly preserved. The duke of that date kept no fewer than seventy game-keepers, and the neighbouring gaols were filled with his poachers. Another passenger asked our driver if he had gathered much experience as to farming itself by his daily journeys. “In course I have,” quoth he, “I know how every farm is worked, and if a farm changes hands I soon observe it.” In this way did our Jehu entertain his passengers, and all seemed to appreciate and to reciprocate his remarks, but one man who observed the strictest silence; remarking this to Fletcher at our halt for the beverage aforesaid, he replied: “he’s a college don, he often comes by my coach, and never condescends to open his mouth to a single human being”. This halting place was Beaconsfield, a name to me then unknown. Now it will be known the wide world over, as giving a title to one of England’s most distinguished modern statesmen, the Earl of Beaconsfield. The march of events projected a railway between the two universities. The illustrious driver of the “Ad Eundem” appeared before the committee of the House of Commons in opposition to the scheme. “How much traffic will there be on the proposed line did you ask, gentlemen? Well, as much as that would carry,” holding up a drawing of a donkey with a pair of panniers. But the bill was passed, the line was made, and the celebrated coach ceased to run. On the “Ad Eundem” then I travelled when repairing as a Freshman to Oxford, and as it wore towards even 4 p.m., sundry equestrians in the country lanes indicated to us that we were not many miles from the university. Then its towers came in sight, soon we rattled over Magdalen Bridge, pulled up at The Angel, now no longer in existence, and a porter piloted me and conveyed my traps to St. Mary Hall. Fletcher failed in his attempt to prevent the Varsity Line between Oxford and Cambridge, which was fully open by 1862. In the Post Office Directory for 1847 Griffin Fletcher was listed as a coach proprietor based at 10 Walton Place, and the 1851 census shows Griffin (58) living there with his wife Ann (49) and their three surviving children, namely Mary Ann (21) and Frances (15), who were governesses, and Griffin junior (7). Gardner’s Directory for 1852 still listed Fletcher as a coach proprietor at 10 Walton Place, but by now many undergraduates and dons would have been taking the train between Oxford and Cambridge, as in 1851 the London and North Western Railway had reached Oxford from Bletchley, providing a connection to Cambridge. On 24 February 1852 at St Paul’s Church, Mary Ann Fletcher of Walton Place married John Looker, a grocer of Romford, Essex and the son of the innkeeper John Looker. 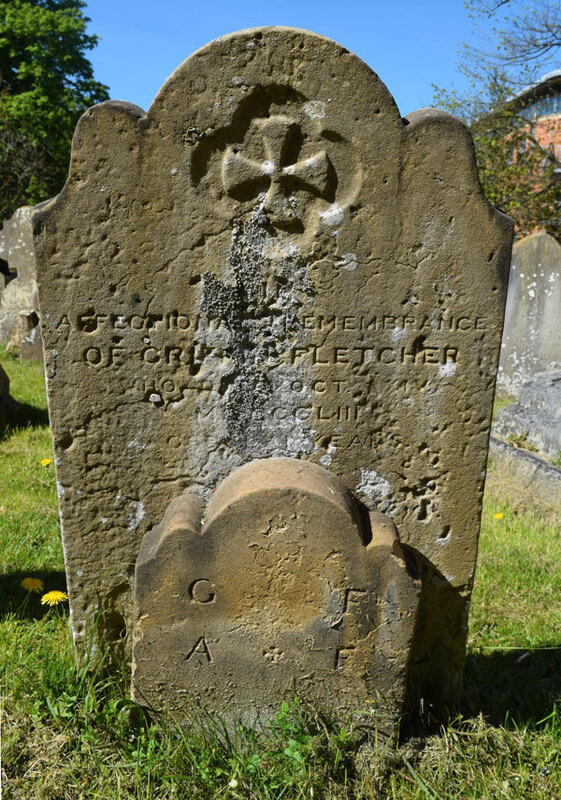 † Griffin Fletcher died at 10 Walton Place at the age of 61 on 24 October 1853 and was buried at St Sepulchre’s Cemetery on 30 October (burial recorded in the parish register of St Paul’s Church). His effects came to under £800, and Letters of Administration were granted almost fourteen years after his death to his son Griffin Fletcher of London. Mrs Fletcher is hard to find in the 1861 census, but her daughter Frances (18) was staying with her unmarried uncle William Fletcher (45), who was a farmer of 280 acres in Foxton, Cambridgeshire; and her son Griffin Fletcher junior (18) was then a draper’s assistant in Reading. On 9 September 1867 at St Mary’s Church, Islington, Griffin Fletcher junior, described as an oilman of 54 Packington Street, Islington, married Ellen East of Hampton, Middlesex, the daughter of the grocer Robert East.. In 1871 Mrs Ann Fletcher (68) was living at 13 Walton Street with her unmarried daughter Frances (35) and was described as a lodging house keeper: only one lodger was in residence, plus one servant. † Mrs Ann Fletcher née Andrews died at Walton Street at the age of 70 on 12 March 1872 and was buried at St Sepulchre’s Cemetery on 16 March (burial recorded in the parish register of St Paul’s Church). Mary Ann Fletcher, Mrs John Looker (born c.1830) was living at 27 Peascod Street in New Windsor in 1861 with her husband John, an assistant grocer, and their children Alice Looker (7) and Frances Looker (3). They were still there in 1871 and their middle daughter Mary Ann (16) was at home with her sisters. By 1901 Mary Ann was a widow, living in Brighton with her daughter Mary Ann. She died in Brighton at the age of 75 in 1905. Frances Jane Fletcher (born 1835/6) became a lodging house keeper in Oxford. In 1881 Frances (45) was living at 16 Museum Terrace (now 13 Museum Road): she had one servant, and her only lodger on census night was Herbert Jackson (the “British Workman”). It is hard to identify her after that date. Griffin Fletcher junior (born 1843) and his wife Ellen East initially remained in London where their first child Mabel East Fletcher was born in 1878. They then moved to Hampshire, where their second child Maud May Fletcher was born in 1870. At the time of the 1871 census Griffin was a fisherman, living at Fisherman’s Cottage in Aldermaston, Hampshire with his wife Ellen and their first two children. Their third child, Ethel Violet E. Fletcher, was born there near the end of 1871. They then moved to Essex, and their fourth child, Griffin Fletcher, was born there in 1873. By the beginning of 1876, they were in Tunbridge, Kent, and their last four children were born there: Ella Frances J. Fletcher (1876), , Robert James Fletcher (1878), Reginald William Fletcher (1880), and Gertrude Christabel (or Christobel) Fletcher (1883). At the time of the 1881 census Griffin was working as a head gamekeeper and living at Fish Lodge, Tunbridge, Kent with his wife Ellen and six of their children. His first wife Ellen died in Tunbridge at the age of 37 on 20 July 1883. In 1884 in Tunbridge, Griffin Fletcher married his second wife, Edith Crawley. By the time of the 1891 census he had moved with Edith to Llanrin in Montgomeryshire where he was the lessee of Warren Farm, and his three youngest children were still living with them. The next year on 16 April 1892 Griffin and Edith Fletcher with Griffin's three youngest children (Robert, Reginald, and Gertrude Christabel) left Liverpool on the Lake Huron for Montreal and established a homestead in Alberta. Griffin Fletcher junior later moved to British Columbia and died at New Westminster there in 1908: his body was returned to Lacombe, Alberta for burial. His youngest daughter Gertrude Christabel (Mrs Goldring) died in Victoria in 1956.